WorldStove founder Nathaniel Mulcahy has just completed two months of work in Haiti, setting up a pilot project that will provide biochar-producing stoves and jobs for the Haitian people. The project was featured in an Earth Day press release from the UN Special Envoy to Haiti (former President Clinton) as an example of “building back better” by incorporating environmental sustainability in the recovery effort. Before WorldStove, Mulcahy was an award-winning industrial designer creating consumer products for large corporations like Emerson Appliances. Eight years ago, while lying in bed recovering from a life-threatening accident, he realized that he needed to focus his energies on innovative designs to improve the quality of life for people who were less fortunate. The result was his invention of the fuel efficient, low emissions LuciaStove, named after the canine companion who saved his life. . The original breakthrough that set the LuciaStove apart from similar gasifer stoves was Mulcahy’s patented design which uses Bernoulli-principle-driven venturis to create a negative pressure while a flame cap based on Fibonacci spiral geometry prevents oxygen from entering the pyrolysis chamber (this is the shape emblazoned in the World Stove logo). The combination delivers better air control for cleaner combustion of the gases produced from the biomass it uses as fuel. It also produces a nitrogen gas charged biochar (the stove excludes oxygen but not nitrogen) that has a nearly neutral pH (7-7.5) making it ideal for many agricultural applications. Mulcahy considers it a matter of respect not only to offer a high quality, efficient stove to the world’s poor, but to make sure that the stove is adapted to people’s needs and not the other way around. WorldStove pilot projects in several African countries, Indonesia, and the Philippines have encountered all manner of local conditions that have required changes in the stove setup or manufacturing techniques. 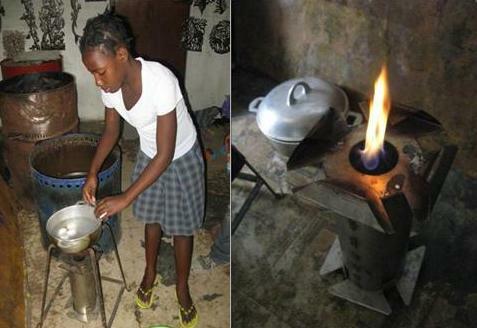 The adaptability of the Lucia stove faced its greatest test in Haiti this winter where Mulcahy carried out a WorldStove Pilot Program in the short space of two months. He not only redesigned the stove to be produced with available tools and materials, but he also completed a camp survey. Crowded camp conditions and the fact that since the quake more children have been forced to take responsibility for cooking made safety a top priority, so Mulcahy developed a Haitian specific pot stand with heat-shield and windscreen to accommodate the wide variety of pots used in Haiti and protect children from burns. Another prize moment was the day that Mulcahy showed up late to a village artisan’s shop only to find the artisan already engaging a crowd of people demonstrating the stove and explaining how the biochar would help restore their soils. “That’s ownership,” Mulcahy said, “and that’s success.” The metal workers started adding lovely decorations of trees and birds to the stoves. Mulcahy said he was told that the pictures represent what will happen if people use the stoves to make biochar – the trees and birds will come back to Haiti. Almost a third of the land in Haiti has lost so much topsoil that it is not arable. As a result, Haiti can no longer feed itself and people have fled to the cities where they were most vulnerable during the earthquake. Biochar can be a critical factor not only in restoring topsoil to Haiti but in revitalizing the rural economy. In preparation for the next phase of the Haiti project, World Stove has established preliminary agreements with 48 agricultural cooperatives that will provide crop waste for pellet production. The farmers will receive a proportionate amount of biochar in return. Such agreements are part of the WorldStove Five Step Program http://worldstove.com/wp-content/uploads/download/five_step.pdf for integrating stove production and distribution with fuel supplies, crop improvement and job creation. This Five Step model starts with a Stove Hub where stoves are manufactured and progresses to adding a pellet mill and biochar soil-building programs. The model always includes a distribution and exchange program that may use micro-finance, donations or barter, depending on local conditions. Mulcahy said that the Haiti experience has confirmed the usefulness of the Five Step Program, while adding some new features – like using biochar for much-needed sanitation. Mulcahy built two aerobic composting toilets that use biochar for odor control and composting efficiency. The resulting biochar compost will be used to build soil. WorldStove is now mapping out the next stage of the Haiti program, working with United Nations Environmental Programme (UNEP), the World Food Programme (WFP) and the Haitian Government to build stove-manufacturing hubs and create thousands of jobs making pellets and distributing biochar in the rural areas. While this next stage is getting organized, Mulcahy is turning his efforts towards other work, including launching new consumer products for the developed world like a BBQ grill and a home heating furnace. There is also new work in Ghana, Togo, Sierra Leone and Afghanistan that had been placed on hold for Haiti. Mulcahy invites anyone who is interested in learning more about next steps in Haiti or contributing to the next phase of activity, to visit the WorldStove website, www.worldstove.com. For updates, you can sign up for the World Stove Twitter feed @WorldStove and YouTube channel http://www.youtube.com/user/WorldStove.